My soul sighed with satisfaction this past week because of the abundance of inspiration around me. It’s been wonderful! First, we watched the 2006 BBC miniseries, The Impressionists, on DVD. This well-written, breathtakingly-beautiful series is told from Claude Monet’s point of view. The series is based on letters, notes, & diaries so the information is highly accurate. I learned that Monet ocassionally painted more than one canvas at a time so he could continue to work as the light changed the appearance of his subject. Each episode is full of gorgeous scenery that makes me completely understand why Money, Renoir, & the others found it so inspirational. The series also shows their actual paintings so you can see how the scenery was interpreted by each man. Highly recommend this for anyone whose eyes hunger for beauty & vibrant color. Second, a friend shared Van Gogh: The Life by Steven Naifeh & Gregory White Smith with me. As soon as I saw the book (that she had to lift out of her totebag with both hands), I exclaimed, “Ooooh” out loud as my eyes opened wide with wonder. It’s a massive biography at close to 900 pages but it, too, is full of photos & works that I had never seen before. I bought a copy so I have time to read it before my artist friends & I take a trip to Philadelphia to see the Van Gogh exhibit next month. I’m about 100 pages into it & have to say that it is extremely detailed. For example, I didn’t know that Van Gogh was working in Paris at the same time the Impressionists were shaking up the art world. (Gauguin was a stockbroker in Paris at that time, too.) All that brilliant talent coming together in one place at one time. Synchronicity… destiny… fate. Lastly, a dear friend sent me the following link that shows 500 years of the female portrait. Take the time to watch; you’ll be amazed! Each of these has been a feast for my eyes & nourishment for my soul. I hope you find what inspires you this week. How might your life be different if you saw yourself as divine? Are you one of the fortunate ones who already does? “Visualization” has multiple meanings, depending on the context, but when it comes to my spirituality, it means that I see a connection to something that is greater than myself yet is my Self. Simply by being alive, I’m connected to the Spirit of All Life. This knowledge has transformed me, inspiring me to live more fully in light & love. Don’t misunderstand me; I’m a flawed human being but seeing myself embraced by Divine light enables me to better accept myself as I am & pick myself up when I inevitably stumble along the way. “Visualization” is the 4th in a series of 12 collages that explore components of a spiritual journey. While all 12 are not part of my journey, I offer them to you as options… opportunities to explore & grow. 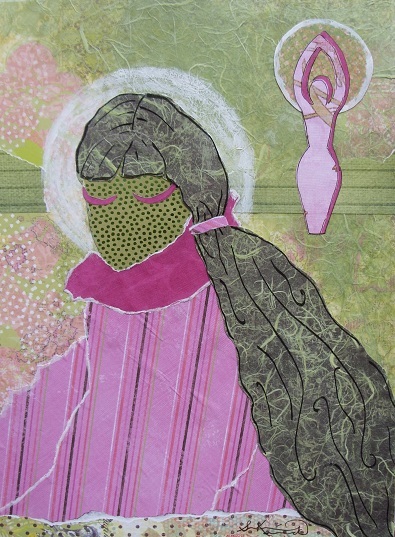 I chose to make this serene woman green to represent women of all ages, races, & cultures. She’s glowing with an inner light, illuminated by her understanding of how she is sacred, made in the image of the Divine. Seeing the light in ourselves fuels it to burn brighter, encompassing others in its radiance. Can you imagine how the world would change if we all did that? Visualize your own pure light & share it with those around you. Visualize your connection to what is sacred to you. The rocks are what matters most. Don't get buried by the sand. Life is full of stones, small pebbles, & sand. The stones are the big things that matter most, like our loved ones, friends, spirituality, & health. The pebbles are the things that are important but shouldn’t take priority over the stones. These vary from person to person but might include work, hobbies, committees, & other responsibilities. The sand is all the “filler” like errands, chores, etc… If you fill your life with sand-sized concerns, you will have no room for the large stones. 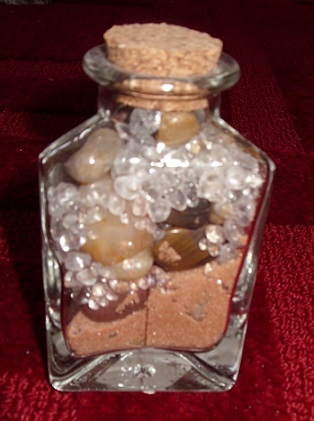 But, if you focus on your large stones first, you can add pebbles & sand in measures that are right for you. Have you noticed how the pebbles & sand-sized parts of your life vie for attention, acting like they are the large stones? That happened to me today. As I waited to get word about a friend having brain surgery, someone called to talk about her work-related drama. It was hard to give “sand” attention when one of my stones weighed heavy on my mind. Yes, there is sand in our jars, too. The house needs cleaned & laundry needs washed. However, when I feel like I’m up to my neck in sand, it’s time to get life back in balance. Commit to my priorities by giving myself permission to say, “No”. What are your stones? your pebbles? your grains of sand? Does your jar have the right measure of each for you? 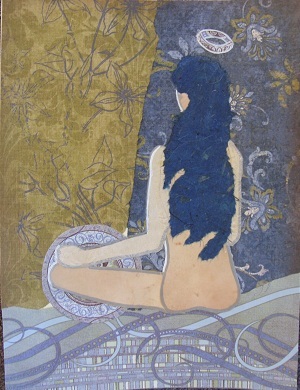 Dance is the 3rd collage of 12 that I’m creating “For the Spiritual Journey”. It’s a component that is part of some faiths but absent from others. Rather than symbolize one particular religion or specific dance form, I chose to create a dancer who loves life & celebrates her connectedness to all things. 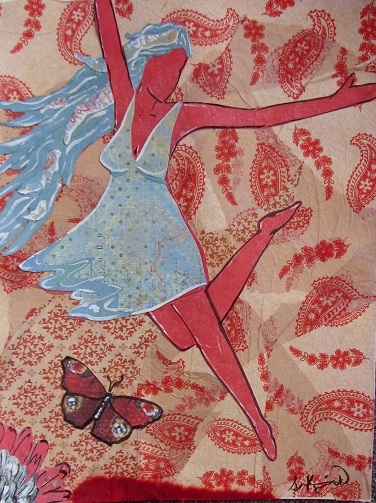 Her joy lifts her off the ground & stretches her beyond the edges of the paper. She is Divine. I’m fascinated by the way our spiritual paths are similar & respectful of the ways they differ. Dervishes in the Sufi tradition whirl to reach a state of religious ecstasy. Buddhist monks & Hindu priestesses may dance as part of a sacred ritual. Pagans may dance around a fire or Maypole to celebrate important days on the Wheel of the Year. Jews celebrate marriage, a sacred rite of passage, with dancing. Some Christian faiths see dance as a way to praise their God. My religious upbringing neither prohibited dancing, as some do, nor was it part of our spiritual practice either. Even now, though my spiritual journey has taken me far from the faith of my family, I don’t dance to connect to what is greater than I. I tend to follow a more contemplative, quiet path & that’s ok, too. So many paths ultimately leading to the same thing. Beautiful!! If you are interested in learning more about how people express their faith through dance, check out some of the videos on YouTube. Even if you’ve never seen dance as spiritual, perhaps you will now. Blessings to you all! Be present. Logical. Makes perfect sense, right? So why is it so difficult to follow this advice in stressful situations? In these moments, we revert to our familiar pattern of behavior despite knowing deep down that “now” is all we have. This topic led to a rich discussion, with friends, about how we handle challenges in our lives. We seem to fall into two broad categories. The first group sits & thinks & thinks & thinks… until whatever they are thinking about has grown into something much worse than it really is. Logic becomes the enemy, creating monsters in the closet. The other group rushes full speed ahead, doing things to stay preoccupied so they don’t have to face the problem. I confess, I’m a thinker who plays “what if” with both my past & my future, coming up with multiple scenarios so I have even more to worry about 🙂 I know it’s not helpful yet I do it anyway. Many of us tend to do the one thing we know doesn’t work for us. Here’s a possible solution… do the opposite. When thinking leaves you more confused & anxious, get physical. Garden, exercise, try a hobby, or play with your dogs. When running to avoid your problems leaves you saying things like, “I’m so busy that I don’t have time to think”, get quiet & still. Listen to your heart. Do the opposite of what you normally do when you are stressed. Reach for food? Exercise. Go shopping? Clean out a closet, giving unwanted items to charity. Call everyone you ever met for advice? Look within yourself for answers by meditating or journal writing. Get outside your comfort zone & see if the change does you good. When I was 12, I firmly rejected the faith of my childhood. God in the clouds– white beard & white gown, casting judgment on poor sinners didn’t resonate with my spirit. That God was “out there” & separate from me; an impossibility because I deeply believe (even at age 12) that the Divine is in me, too. Since I began my spiritual journey, I’ve visited a number of churches, temples, & synagogues around the world from the United States to Europe to the Middle East. Here’s a secret… no matter the faith, we all pray. Our forms of prayer are as different as we are– standing, sitting, kneeling, facing east, facing a cross, hands folded, hands raised, eyes closed, eyes to the sky, quietly, loudly, alone, in a group– all is prayer. And what is prayer? Our way to connect to the Divine in a way that feels right to us. 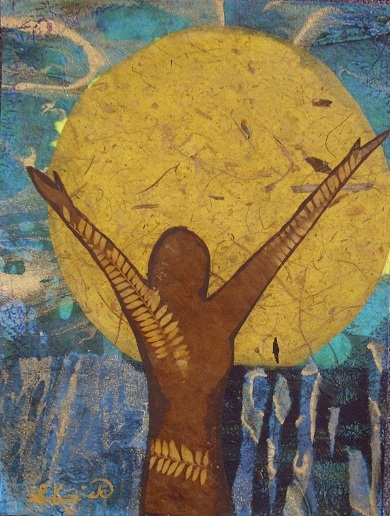 This collage, the second in my “For the Spiritual Journey” series, is simply titled Prayer.